Sharing with Groups works well now, I fixed the slowness problem which I reported last week and re-enabled the feature. Also, as promised, the new and improved Forum is now live, and welcomes discussions. 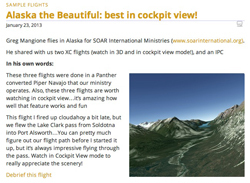 We have a new area on our blog (accessible from our site) for Sample Flights, contributed by CloudAhoy users. Check it out. Thanks to the pilots who shared their flights and stories. If you have a Flight & Story that you would like to share, please send it to me. And now – Oshkosh 🙂 Reminder: see a previous post. I will depart en route KOSH soon, with my friend Etan who is also a CloudAhoy team member. For those of you who will be there, I hope to meet you face to face.